An outing to the beach after Olga had moved on – it was still very humid with a slight off-shore breeze and millions of mosquitoes. 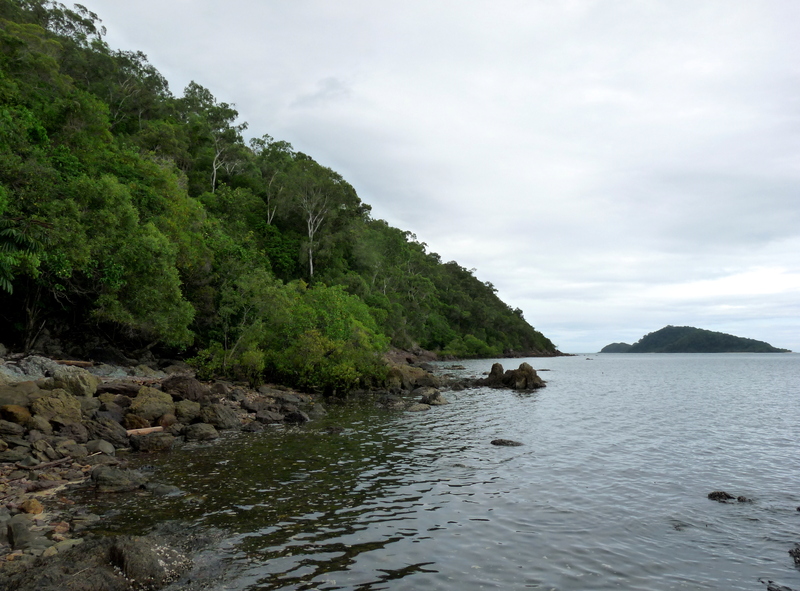 The southern end of Cape Kimberley beach meets the Daintree River mouth – we were not there to risk swimming with ‘stingers’ or with crocodiles – rainforest, beachfront vegetation including quite an interesting selection of mangroves provides plenty of interest. 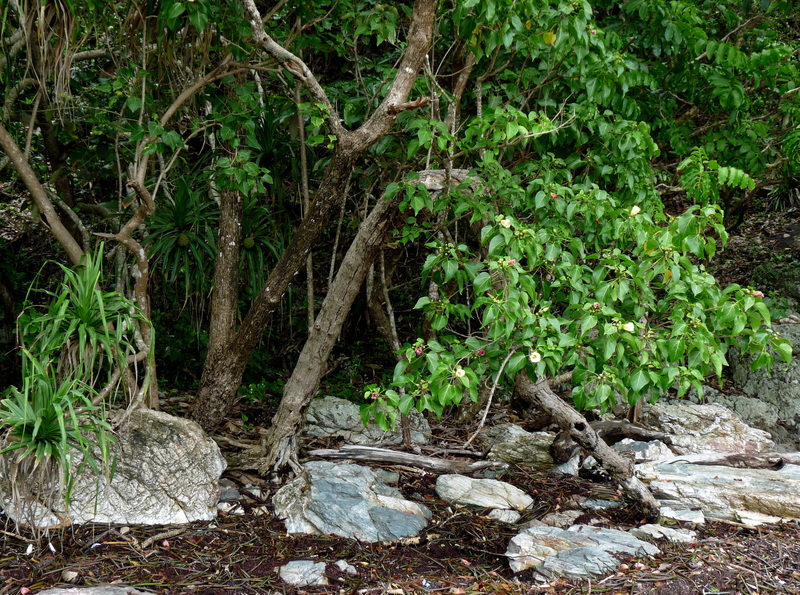 Grey Mangrove, (Avicennia marina), Red Mangrove (Rhizophora stylosa) and River Mangrove (Aegiceras corniculatum) were growing together – about the middle of the first photo. The prevailing winds blow seed and lots of rubbish from passing boats into this corner. And the lovely Thespesia populnea was flowering next to its close relative Hibiscus tiliaceous – its spent flowers decorating the beach detritus. However, I am drifting away from my topic. We walked as far as we could along the rocks then had to start making our way back before the incoming tide cut us off. 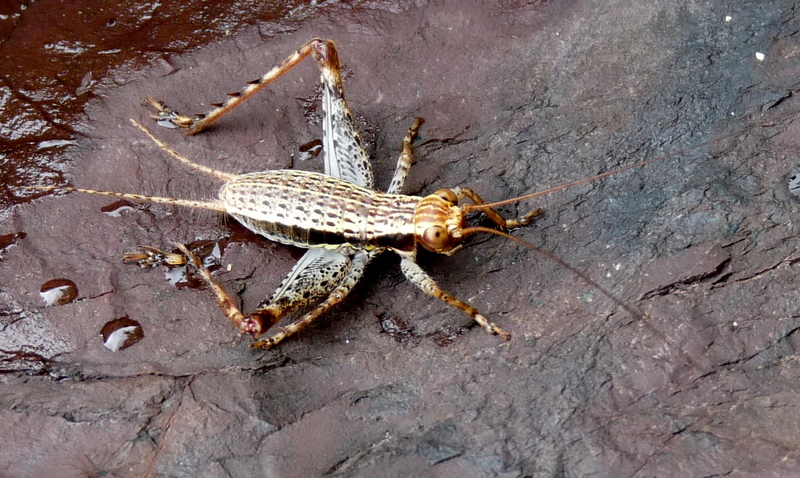 A movement near one of the rock puddles caught my eye and I called out to Allen for the camera – I haven’t been able to identify this cricket yet although I have sent the photo to a couple of entomologists I know, so I’ll update the post as soon as I have more information. Its worthwhile clicking on the image to look at the detail – wonderfully intricate patterms and fine filaments. Your image looks like a male nymph of Cardiodactylus novaeguineaensis (Gryllidae:Eneopterninae) which has run out from the rainforest edge and got lost. The winged adult is quite distinct with 2 white dots on the forewing. As the name suggests its also found in PNG and is probably a recent Asian invader (when there was the land bridge). This entry was posted in Beach, Insect Life. Bookmark the permalink.